Esposito's response? Three straight games of three points or more, with a total of three goals and 10 points along the way. Not bad for a kid who just turned 19. In addition, Esposito and the rest of the Quebec Remparts won each of the three games, defeating the Drummondville Voltigeurs on Wednesday, and then sweeping a home-and-home with the Victoriaville Tigres on Saturday night and Sunday afternoon. In all, the Remparts outscored their opponents by a 22-8 margin, and Esposito had a hand in almost 50 percent of his team's offense. Is that Vince Vaughn watching Esposito from behind the glass in that picture? BFD. 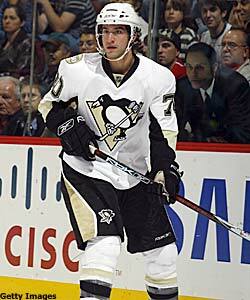 The Pens don't need another young scoring center (how awesome is it to get to say that???). They needed an older guy with some playoff experience who could play at Sid's level, and that is exactly what they got in Hossa. Don't listen to anyone who says Hossa doesn't perform in the playoffs. He's got 35 pts in 55 games;not exactly his point per game regular season pace, but still good. Regardless of how good Esposito turns out to be, this was a move that the Pens had to make. Great...He's only been playing jr hockey for 3 years now. Tavares is in his third year and has 50 more points...and he's only 17! Esposito was traded b/c he's the second coming of Alexander Daigle, Milan Kraft, and Alexander Morozov. NO HEART. Let's not jump all over Espo, the kid has a bright future. Scoring a ton of points in Junior doesn't really impress me though, Tyler Wright scored a ton of points in junior too and he wasn't much of a NHL player. I'll wait till Espo starts putting up numbers in the NHL before I get all over Shero for this deal.